Euthanasia Prevention Coalition Euthanasia Prevention Coalition: Fatal Flaws film will change the way you view assisted death. The Fatal Flaws film and pamphlets can now be purchased (Link) and the Fatal Flaws Film can be purchased and downloaded (Link). 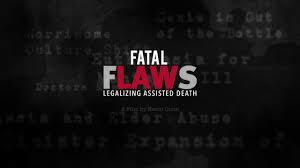 Recently Fatal Flaws was screened in Guernsey (UK) while their legislature was debating assisted suicide. One of the sponsors of the assisted suicide bill watched Fatal Flaws. The next day he stood up in the legislature and said that he changed his mind after watching Fatal Flaws. Guernsey then defeated the assisted suicide bill by 24 to 14. Fatal Flaws features personal stories from people who oppose assisted suicide but also interviews with leaders of the death lobbies in the Netherlands and the United States. The Fatal Flaws pamphlet is based on the stories in the film. The pamphlet is excellent for distribution at a screening or opposing euthanasia and assisted suicide. (Inside of the pamphlet) (outside of the pamphlet). Further Discounts: All orders can be made online (Link). With any Fatal Flaws order, get The Euthanasia Deception documentary for $20. Further bulk orders are available upon request. The Fatal Flaws Film will change the way the culture views assisted death. Fatal Flaws features incredible stories that have never been told before. The most shocking story concerns Margreet whose mother was euthanized in the Netherlands without consent. Please watch and share this film clip. Fatal Flaws also features the story of Candice Lewis (Link) from Newfoundland, Canada who was pressured by doctors to die by assisted death. These two powerful stories are a small but important part of the Fatal Flaws film. The Fatal Flaws companion pamphlet is designed to re-enforce the message of the film. The pamphlet is excellent for promoting the film or for distribution at a screening. Many of our supporters purchased The Euthanasia Deception documentary, two years ago, organizing screenings throughout North America and all over the world. Does it cost extra to be able to show the film in a group setting such as a parish? There is no screening fee. It is our goal to have Fatal Flaws seen by people. How long is the film? What would be the age range for a showing within a parish, or ladies group? How soon could we obtain a copy?